Wikipedia has issued an official statement confirming a planned blackout on January 18. Scroll down for update. Wikipedia has apparently joined the ranks of several high-profile websites that are planning a "blackout" on Wednesday, January 18, in protest of Congress' proposed anti-piracy legislation. During the blackout period, many web pages will become unavailable and will likely be replaced with information about the protest. Wikipedia co-founder Jimmy Wales took to Twitter on Monday to announce that the English-language version of Wikipedia will go dark on Wednesday for 24 hours -- from midnight EST on January 18 until midnight EST January 19. He noted in a later tweet that "Final details [are] under consideration but consensus seems to be for 'full' rather than 'soft' blackout!" Wednesday's so-called SOPA Strike was initially proposed by Reddit, which will go dark for 12 hours to protest H.R. 3261, the Stop Online Piracy Act (SOPA), and S. 968, the PROTECT IP Act (PIPA). These bills are designed to punish primarily foreign-based websites found to violate or facilitate violations of U.S. copyrights. Backlash against the bills has been strong, particularly among the online community. Google, eBay, Mozilla, Twitter, Facebook, Huffington Post parent company AOL and other web giants have formally opposed the bills. The popular Cheezburger Network has joined Reddit in committing to a blackout-protest on January 18, as has news blog Boing Boing and several other prominent sites. Community classified ads site Craigslist has also come out recently against the bills but has not officially stated that it will participate in the blackout. According a tweet posted by @Jimmy_Wales, Jimmy Wales' official Twitter handle, Wikipedia is planning for its January 18 blackout to affect only en.Wikipedia.org, though, the tweet continued, "the Germans will run a banner, and other languages will make their own decisions." A representative for Wikipedia was not immediately available for comment. On January 14, the White House published a letter voicing concerns about SOPA and PIPA. The letter also stated and that, moving forward, the Obama Administration will work with both opponents and proponents of stopping copyright violations online to pass effective legislation in 2012. On January 13, House Majority Leader Eric Cantor (R-Virginia) said SOPA will not reach the House floor until its perceived flaws are addressed. Senate Majority Leader Harry Reid (D-Nevada) told MSNBC on Sunday that the Senate will move forward with PIPA in the coming weeks. 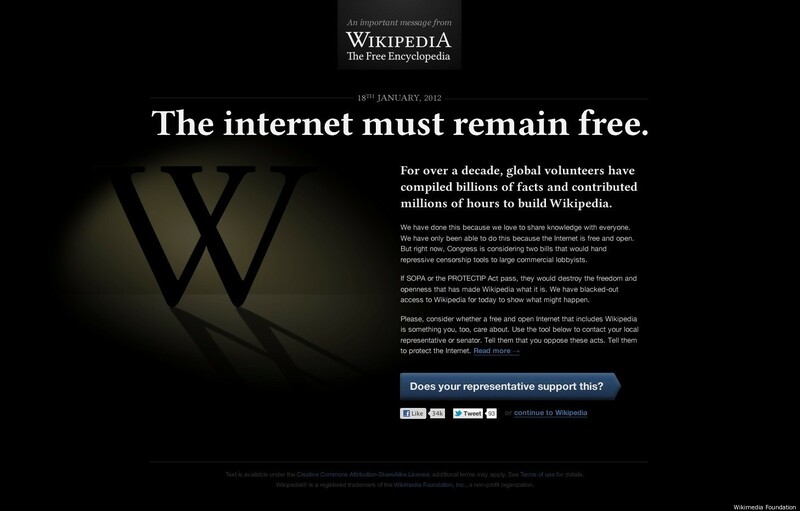 Wales has been considering a Wikipedia protest of SOPA since December, when he asked users via his Wiki "talk page" whether the Wikipedia community would support a global blank-out of English-language Wiki pages. In October, the Italian Wikipedia staged a protest of the Parliament's so-called "Wiretapping Bill" by taking down all Italian-language encyclopedia entries and replacing them with message about the controversial law. It.Wikipedia.org is Wikipedia's fifth-largest network, with more than 881,000 articles. The English Wikipedia, with its nearly 3,850,000 articles, is Wikipedia's largest Encyclopedia. Jimmy Wales tweeted a comScore estimate that each day 25 million visitors from around the world access English-language Wikipedia pages. UPDATE 1: Wikipedia users can view proposed designs for "blackout pages," which may appear in place of normal Wikipedia entries during the protest on January 18. Take a look at the screen shots (below) to view two of the designs. 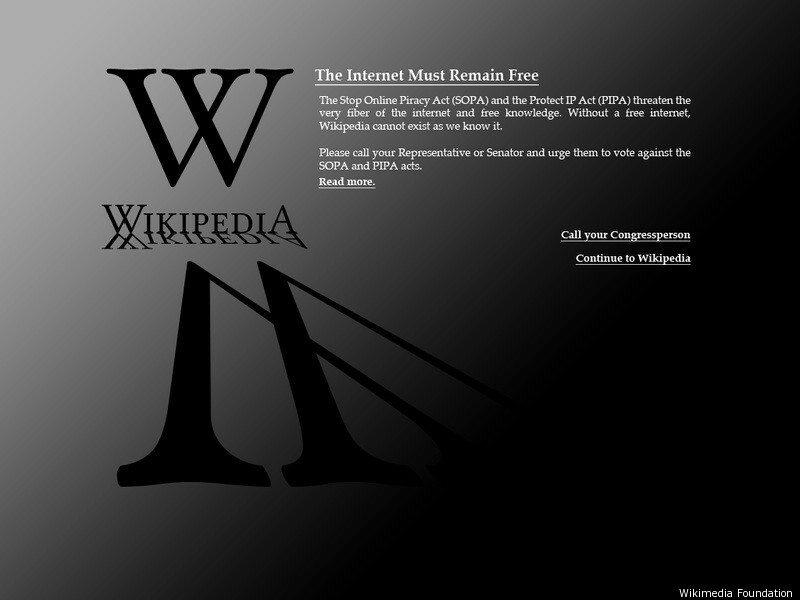 UPDATE 2: The English-language version of Wikipedia will go dark at midnight on January 18, in accordance with the opinions of the majority of community members who took place in a debate about protesting Congress' SOPA and PIPA bills.